Flood Buckets (sometimes known as Cleaning Buckets) are buckets filled with supplies that enable people to begin the overwhelming job of cleaning up after a flood or hurricane. This is a practical way that individuals can provide relief to the victims of Hurricane Florence. See below for details. Please ensure each item listed below is included in your bucket. Only fully assembled buckets will be accepted. Place all liquid items in the bucket first. Place remaining items in the bucket, fitting them around and between the liquid items. Scouring pads and trash bags can be separated in order to fit all of the items in the bucket. Clothes pins may also be placed in a small resealable bag. Secure the lid on the filled bucket. · Approximate cost of supplies for a flood bucket is $65. 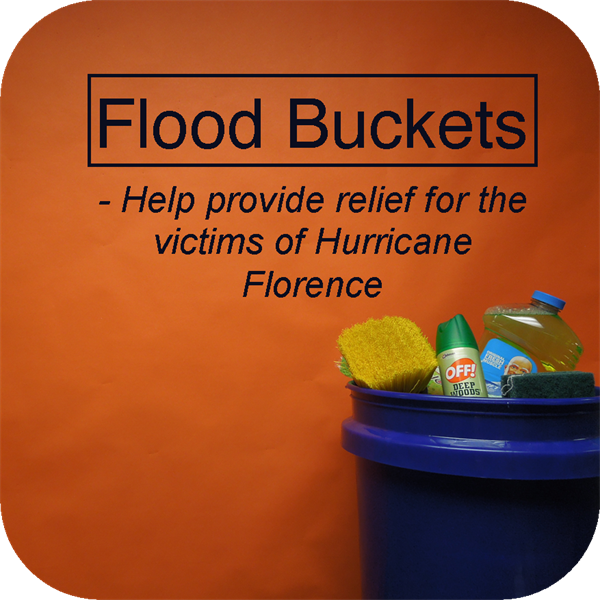 · Consider joining with friends to assemble a flood bucket. · All items must be new except for the actual bucket and lid. · All cleaning agents must be liquid form. No powders are accepted. · If you cannot find the requested size of a liquid item, use a smaller size. Including larger sizes of any item will prevent the lid from sealing. · Do not include any personal notes, money, or additional material in the kits. · Contents of kits should not be imprinted with cartoon characters, advertisements, religious, patriotic, military, or camouflage symbols. Processing & Shipping Costs: $3 per bucket. If you wish to make a contribution for flood buckets and shipping cost, please make your check payable to Front Street UMC with “Flood Buckets” in the memo line. Hygiene/Health Kits are also needed. Click here for a list of materials and assembly instructions. Drop off your fully assembled bucket(s) or Hygiene Kit(s) in the Welcome Center. * inspect assembled buckets at FSUMC (once a week) to ensure all necessary items are included. To volunteer, please contact Patrick Murphy at Patrick@frontstreetumc.org or call 336.227.6263.